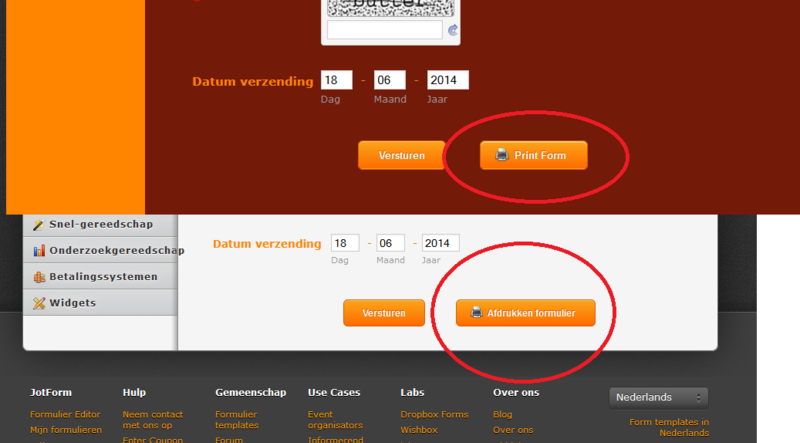 When I make a form with the possibilty to print the form, the text on the button is right "Afdrukken formulier". Nicer or better is "Print formulier" or Formulier afdrukken". On the website is the text on the button "Print Form". I will use only Dutch text and Englisch text between it see not so nice. How can I change it. Jotform has built in languages that automatically changes clear and print button text when you switched your form builder to a different language. However, there are lovely users that always looks for a custom one. Well, that's possible! Here's a workaround on how to change these text with the power of CSS. b. On the Preferences window, go to Form Styles tab and then insert your CSS Code under Inject Custom CSS Box. 2. 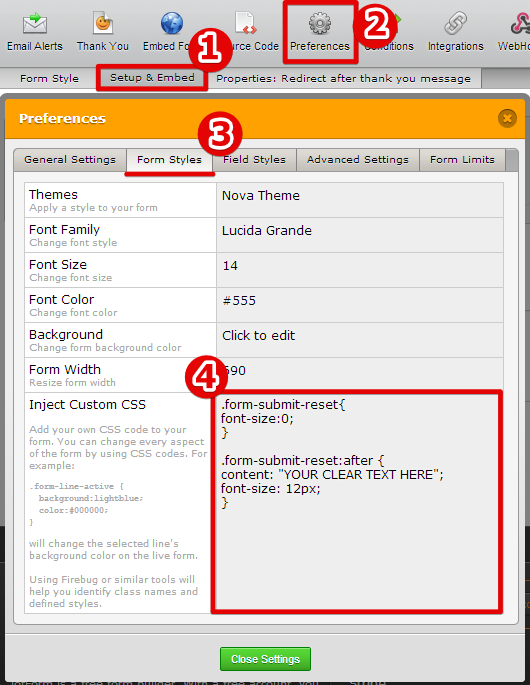 Inject the following CSS codes to your form. You can pick which one you'd like to apply. a. 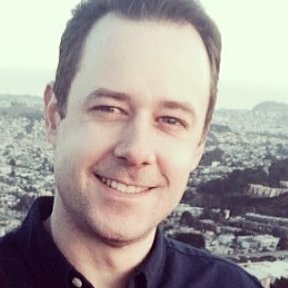 To change Clear text, inject this CSS. a. For the Print text, use this. Just replace the content text to your preference. Note that this isn't supported with older IE browsers like IE7 and earlier. It doesn't work. The text "YOUR PRINT TEXT HERE" became after "Print Form". The text on the button is now"Print Form Print fromulier". I think that the problem is in "after" what David give me. Am I correct to assume that you were able to resolve the problem using the link you provided above? Were you able to resolve the problem by replacing the ":after" on the CSS code? Let us know if you still need out assistance. Yes I fix the problem with the link above. On a few felds you must addit it with !important. That are missing in the answer of David, why it didn't work. Thanks for updating us on this solution. Good to know that everything is solved. Please get back to us if further support is needed.